How can we build and strengthen relationships across communities as we look to decolonize ourselves and the world around us? For our first digital dialogue of Season 1, we held space to explore this questions and others as part of “Decolonizing our Dreams,” with Aslam Bulbulia, a community builder and leader who has been hosting dialogues and reflecting on the links between decolonial practices in Vancouver and South Africa over the last 2 years. Aslam Bulbulia is a new settler on Coast Salish territories from South Africa, with Indian heritage. His wide variety of projects and experiences include a Mosque tour of Johannesburg, travelling and teaching English around the world, performing stand-up comedy, co-producing a Palestinian-solidarity album, working for a large multi-national corporation and various research positions within different spheres of government. 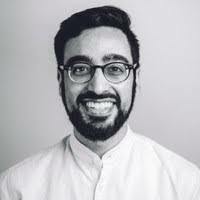 Aslam now leads the Community Engagement Initiatives at the SFU Centre for Comparative Muslim Studies, is the co-host of the SFU RADIUS Fellowship in Radical Doing and part of the design team of the 2019 Muslim Community Fellowship. Join the CKX Questions mailing list to get periodic updates and invitations in your inbox. Thanks for subscribing to CKX Questions.